Will Yours Be One of the Half of all Marriages that End in Divorce? Divorce has a high cost, both emotionally and financially. While a prenuptial agreement can’t stop the heartbreak of a failed marriage, it can take the stress and financial cost out of issues such as property division and alimony. If yours is one of the half of all marriages that end in divorce, it’s best to be in a position where you know how property issues will be resolved. At Corriveau Family Law in Northville, Michigan, we offer a free initial consultation to discuss prenuptial and postnuptial agreements. 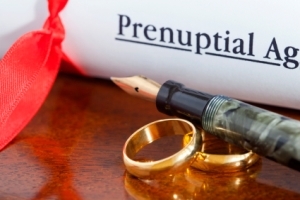 What Is Involved in Drafting a Prenuptial Agreement? Our lawyers have made prenuptial (before marriage) and postnuptial (after marriage) agreements a niche area of our law practice. To draft a competent agreement, you need more than a lawyer. You need a lawyer in conjunction with a financial planner, an accountant and a probate advisor to create an agreement that fits your needs and your assets. We suggest you seriously consider a prenuptial agreement if you have been married before, if you have significant assets or if you expect to have significant assets in the future. If you have children from a prior marriage, then a prenuptial agreement and estate plan can help preserve family peace and ensure that your assets go to the person you want to receive them after you die. Sadly, our lawyers have seen many families torn apart when a parent dies and the deceased spouse’s children are disinherited in favor of the children of the surviving spouse. Our lawyers can draft documents that will both reassure and protect your children and heirs. For a free initial consultation about prenuptial or postnuptial agreements with an attorney at our Northville firm, call 248-380-6801 or fill out fill out our contact us form.